It's finally here. After half a week's worth of strong media push from DC Comics, and enough off-the-cuff chatter about Robert-Pattinson-as-Superman that one might've expected to find sparkly vampires inside, Superman: Earth One arrived in comics stores today. I've read it and I'll say: it's good. It's not great, but it's good, far stronger than said chatter would have you believe. Writer J. Michael Straczynski's smart choices balance out a fairly straightforward plot, but ultimately all the set-up here succeeds in making me eager for the next volume. 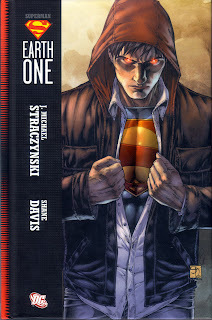 My concern going in to Superman: Earth One was that Straczynski's would be the rumored "emo" Superman -- young, overemotional, and initially self-aggrandizing; a Clark Kent who would have to be convinced to use his powers for good instead of for fame. This couldn't be less true. Clark tries out for professional football, but he also applies for a job researching renewable energy, and all of it for the purpose of making money to send back the widowed Ma Kent. When she tells Clark to find his own path, he's initially reluctant; he may not want to be a superhero, but neither is he only out for himself. Straczynski's Earth One Clark Kent may be moody, sure, but he still has the heart of "our" Clark Kent. Among one of the key changes Straczynski makes to the general Superman mythos (different from John Byrne's Man of Steel, at least) is that Clark already has his costume when he arrives in Metropolis, it's his parents who're encouraging him to be a superhero, and it's Pa Kent, now deceased, who names him Superman. In the Byrne version, Clark is driven to save lives and so subsequently needs to create the Superman identity; on Smallville, Clark's heroism is thrust on him by Jor-El, whereas the Kents have tried to hide and shield Clark's powers. In Earth One, the Kents encourage Clark to be Superman, even as Clark is reluctant because he knows it means sacrificing a normal life. He would not be Superman at all, except that to an extent he discovers that being Superman is where he fits in, that he has more commonality with Lois Lane and Jimmy Olsen standing up to alien conquerors than he does with working at a research laboratory funded by corporate greed. Clark doesn't want to be alone, but he'd be deeply unsatisfied with any life of good that he can do other than the good he can do as Superman; and, as a close second, he sees that dedication to good reflected in his colleagues at the Daily Planet. I find this cogent and convincing. I also like that Straczynski weights Clark's relationship with his father -- growing up, becoming his own man -- over Clark's relationship with Lois; Lois has nearly no role here in making Clark Superman. I found this refreshing, more like Lois and Clark on Superman: The Animated Series than anywhere else -- co-workers, they are, and not lovers. All too often in Superman origins, the eventual marriage of Lois and Clark seems inevitable, lacking the necessary drama; here, I appreciated that Straczynski seems almost to ignore the relationship entirely, all the better to start a slow build two or three volumes hence. Rounding out the cast, Straczynski offers no Lex Luthor -- the Superman/Lex relationship having perhaps been done to death in Smallville and Geoff Johns's Superman: Secret Origin -- nor any Kryptonite, for that matter (potentially government agent Sandra Lee will take the Lex role). Straczynski's Perry White is just as very nearly identical to that of the regular comics as his Jimmy Olsen is different, distressingly so. I don't mind Jimmy as a fearless daredevil photographer, but halfway through Earth One, I near expected Jimmy to bend steel himself. It's Jimmy who inspires Clark to put on the costume, Jimmy who initially saves the new Superman from danger, Jimmy who takes super-perfect pictures of Superman that near single-handedly save the ailing Daily Planet. Perhaps as a result of Straczynski pulling Lois back a bit, Jimmy comes too far forward, ridiculously; I don't much like "our" Jimmy, either, but I didn't find this Jimmy an improvement. Ultimately, the story of Earth One is that in the face of Clark's reluctance to be a hero, the alien Tyrell comes to Earth hunting Clark and threatening to destroy Earth to get to him; seems Tyrell's people took a contract to destroy their enemy Kryptonians, and now have to finish off the lone survivor. Tyrell's invasion takes up three-fourths of the book -- almost the only crime this Superman stops -- and unfortunately Tyrell isn't more than a one-note villain, not unlike Nero in the recent new Star Trek film. What's interesting is Tyrell's revelation that Krypton wasn't destroyed, but rather murdered; and the mysterious foe that contracted Tyrell to destroy the planet. This is true for much of Superman: Earth One -- the plot is swift and formulaic and moves almost immediately to Superman's fight with Tyrell, but what distinguishes and redeems Earth One are Straczynski's creative updates -- that Krypton was murdered, that Pa Kent named Superman -- as well as an overall smooth writing style, believable dialogue, and some fine humor along the way as well. I hold out hope, by the way, that the mystery master villain of Earth One turns out to be someone from "our" DC Universe. The book makes no use of and gives no nod to the phrase "Earth One" such that DC could have easily called it "Rebirth" or "Steel" or "Generations." I'm keeping my fingers crossed that we find out later that Earth One is really "Earth-1" and that Tyrell's mysterious benefactor is Brainiac perhaps, or the Cyborg-Superman (in as much, I recognize, as this would repeat the aforementioned Star Trek). If Earth One, taking place in the span of an afternoon, doesn't have the scope of Byrne's Man of Steel, it still equates enough of a Superman television movie that I would give it to a new comics reader without hesitation; again, there is nothing insulting or poor here, and the premise is interesting enough that I'm convinced to read more. In addition to the flaws I mentioned, Superman lets Tyrell die in the end when he might have saved him, and I can't quite condone that for Superman -- but it's no different than Batman with Ra's al Ghul at the end of Batman Begins, and I recognize that's the kind of aesthetic under which Straczynski is working -- Superman by way of a new twenty-first century superhero movie. In that vein I think Superman: Earth One succeeds -- an accessible Superman graphic novel for the less comics-centered, graphic novel-buying audience. Not too excessive an amount of Superman angst here. And no vampires. There is lots more to discuss regarding Superman: Earth One, which we'll address on this blog over time: other reviews of the book, how the reception to Earth One will shape future volumes, Earth One as a publishing strategy, and more. Next week, however, tune in for the annual Collected Editions Guest Review Month, a fantastic look at a bunch of different books by some very talented guest writers; I love seeing what the guest reviewers come up with, and I hope you will too. I'll be around, too, and I look forward to your comments on Superman: Earth One. Thanks! Could you then, take it as a SUPERMAN reboot (yet,as you said with nothing suggesting this is Earth-1) and then compare it with the other reboots? I have not read Secret Origin, but I would characterize Earth One as inferior to Man of Steel (Man of Steel was more iconic, and with Luthor, Batman, Bizarro, etc., more far-reaching). Earth One is equal to Birthright in my opinion. Birthright and Earth One accomplish the same thing; they both read like television pilots or the first in a Superman movie trilogy -- establish the supporting characters, establish the conflict and motivations, things blow up, the end. As opposed to Man of Steel, Earth One is bubble gum. Good bubble gum, flavorful bubble gum, gum I would buy again, but bubble gum nonetheless. I agree with a lot of what you said about the book. I liked the overall characterization of Superman, and was pleasantly surprised that Superman himself wasn't too angsty or bitter. But I found the dialogue and pacing of this book to be unbearable. Not one of the worst books I've ever ready (sadly) but I definitely think I would have enjoyed it more if I was a kid. So yes, bubble gum. I also thought that this certainly wasn't good or unique enough to warrant the 8,000th retelling of Superman's origin. Honestly looking forward to your review of Grounded when that comes out in trade. JMS seems really inconsistent, and that makes his work hard to track. Grounded just feels like a mess in singles, while I'm actually still a little excited to read this and sure that it will at least be disposable fun. SkyCaptain mentioned poor dialog. What I've read in the previews so far seemed great in comparison to the stilted, awkward, preachy, and melodramatic dialog in Grounded. As for Secret Origin, it's very much in keeping with the Silver Age. It starts off with some really great character issues, and then the second half of the series feels rather empty and bland. I didn't mind the dialogue, but I see what SkyCaptain means (and I think SkyCaptain's review had some fair points). Especially in terms of the new Jimmy, some of the "We got it" was a bit too on the nose -- but I view Superman: Earth One like an action movie, and sometimes action movies have overwrought dialogue (not to mention, it's still Superman comics, not Shakespeare). I enjoyed some bits of humor, too -- basically, much better than the stilted conversations between Superman and Flash or Superman and Batman that I've read in Grounded. One other thought re: Birthright -- One reason Birthright ultimately failed for me is that it didn't go anywhere; even if it was meant to be Superman's new origin, ultimately it became re-telling Superman's origin for re-telling's sake. If not for the Birthright problem (which I think was DC's problem, not writer Mark Waid's), Earth One might feel fresher -- and what I do like is that the Earth One has a purpose and will continue to be used in the Earth One books, as opposed to Birthright. It's starting to sound like the media really made the whole thing overblown. I've seen several point it out as emo because Superman was wearing a hoodie on the cover and so on. So much for not judging a book by it's cover. The book was judged long before it even came out. So, at this point, after hearing the positive and negative reaction, my question is: Do we think that Earth One is actually going to be a strong ongoing continuity? It may be too early to tell, I guess, but some people on forums seem to assume this is going to result in a continuity as large as the Ultimate Marvel universe. Considering DC's past track record, though, I'm pretty doubtful - even if it's good, I'm not sure it will run that long. CE you might have a point there. My introduction (courtesy of the local publisher Gotham Comics)was with MAN OF STEEL 1, published as SUPERMAN 1 here. Issue 2 here was SUPERMAN (1987) 1 and the series continued with the same title, later reprinting only MOS 3 in the BATMAN title no less with a purported "The first time Superman meets Batman". So I could never net all the issues and read it as a whole first. I could read it in collected form only a month or so ago. I didn't like it that much. Sure, Byrne new he had a lot of room to tell whatever he wanted to....he knew that he was being put on TWO monthly titles. I'm fine with non connected issues but issue 5 felt like it was hardly required...it never seemed like an ongoing story kind of thing. I'm not opposed to one shots or collection of one shots...I'd LOVE collections of one shots from BATMAN: LEGENDS OF THE DARK KNIGHT or BATMAN: GOTHAM KNIGHTS. BIZARRO was never that important or that good a villain to merit an appearance in the inaugural mini....SECRET ORIGIN was a good step in that direction....they included the LSH and also made the appearance of PARASITE seem relevant. When they started BIRTHRIGHT in India, without any hype or anything, in the SUPERMAN monthly, I was "huh. what's this? why?" but I just read along.The first two issues were too good for something which was a reboot. I was left gasping for more. As I read BIRTHRIGHT before MOS, I liked it more. Not to say Byrne did anything wrong & I'm a Waid fan all the way...I hadn't even started noting writing credits...coz they published Waid's other work like JLA & FANTASTIC FOUR much later...this was what made me start looking for more of Waid. Plus a lot of good character moments with Lois, Perry, Pa Kent, Lex & Clark...that's my current top choice. Yeah, it was a good story but I agree with CE there was no specific reason to do it, but (at the risk of sounding like a hypocrite) I'm glad it was done. I'll buy EARTH ONE by next week. Collected Editions, I agree with your point about the clumsy dialogue being somewhat equivilant to that of a blockbuster movie, where expectations are lower. And yeah, it's certainly not Shakespeare. But my problem is, at their best, superhero comics can be as good as Shakespeare, or any literature. As far as Superman goes, honestly, I'd put Superman for All Seaons and All Star Superman up there with Hamlet or MacBeth. Ian, I'd bet that DC does intend for this to be something akin to the Marvel Ultimate universe. But I doubt that it'll take off the way the Ultimate stories did; I have a feeling there will be a few more of these graphic novels (or a handful of monthly floppy series), but that ultimately, it'll basically become a sporadic Elseworlds-type thing. Anyway, I really appreciate the discussion here. Lots of interesting thoughts. Definitely the larger media ran with this idea of an "urban" or "emo" Superman seemingly, at times, without having ever read the book. Of all my preconceived notions of Superman: Earth One, perhaps was surprised me most was how similar, at his first introduction, this Clark Kent is to the "regular" Clark Kent -- still a farmboy, still a young man arriving in the big city, still with good basic moral principles. I like to think Earth One, like the story or not, portends something good for the continued growth of the comics medium into the mainstream book market, but media outlets' knee-jerk reactions (New York Press, Entertainment Weekly, USA Today, Daily Mail) are an unfortunate reminder of the larger population's still stereotypical idea of comic books. My hope is that the Earth One line will develop as a lively comics universe, all in graphic novel format, and that it will be an indication to publishers that long-form original comics and continuity can co-exist, such that maybe we'll see books with the Earth One graphic novel format set in the regular DC universe. I've said it before and I'll say it again, I'd love to see a Manhunter graphic novel, published all at once in one volume, that spans for instance from DC's next crossover Flashpoint to the crossover after that. In-continuity, relevant graphic novels -- that's where I hope we're going. I suppose whether it will be an Ultimate style universe remains to be seen. They seem to be looking in that direction, at least. Just cautiously; which is understandable, because there is a real question of whether a trade only continuity will be a profitable venture. After all, there's no windfall here; usually a comic makes it's money back with the single issues and then the trades are profit. OGN's aren't typically prominent because they take time to get into the black, which doesn't help a company that needs to operate on a day to day basis. This is really what some people - mainly the ones who think "monthlies are dead" and right-to-trade releases are the future - simply don't understand. Anyways, I guess time will tell how the venture pans out. If it works, we could probably see more. If not, there's a good chance it'll be looked back on as a curious experiment. I do wonder if more folks are interested in the Earth One Batman over this one, though. At the very least, I can't see as much upset over an "emo Batman" -- Batman's never been all that bright and cheery to begin with. I do appreciate that DC took a risk starting the Earth One series with Superman instead of the arguably more popular Batman; Superman was first in the beginning, and I'm glad he was first here, too. One good point the IGN review made, though the reviewer wasn't happy about it, is that with Krypton having been purposely destroyed, Superman becomes Batman -- his mission is to avenge his parents. I'd be curious to see Geoff Johns turn Batman: Earth One in a similar way -- maybe on Earth One, Bruce has some motivation to become Batman *other* than the death of his parents. By the way, I really liked the comparison of Tyrell to the generic cookie-cutter villians that have appeared in recent Star Trek movies. That was dead on, right down to his oversized spaceship. It's sad, because I always thought of JMS's Babylon 5 as being the antithesis of that stuff. I finished reading EARTH ONE today and again agree....bubble gum....delicious bubble gum but bubble gum. While I didn't like the alterations....Jonathan Kent being dead, Jimmy Olsen,Tyrell etc these are what made the book different from other stuff elsewhere. I haven'tread any TANGENT COMICS but wasn't this the premise of Tangent too? Till now I see nothing else to separate it from ELSEWORLDS line of stories, except that they are going on full scale to create a new continuity. But this one made me feel good enough about picking up the rest, whenever they do arrive. yes yes yes definitely more in-continuity first run graphic novels. If anything, I hope the sales are enough to get people moving in that direction. I finally read earth one and I have to say I loved it. I thought it made sense to portray clark as a young man on a journey to find himself. other superman origins portray superman as all knowing, perfect and extremely selfless even at a very young age. What Straczynski does is present us a psychologically believabale young man who is, like all of us at that age, a bit lost and sef consumed. I think that Stranczynski also poses a viable question: why would clark want to be Superman? He also delivers a convincing answer: he doesn't! clark becomes superman out of necessity, compassion and a feeling of guilt. Something terrible happens and he is forced to become Superman. He did not become the man of steel fully willingly. He was faced with a great challenge and he chose to rise up to it. Again this is very relatable. Clark is not the experienced and god like superman. He is the young superman that has all the potential to become the iconic figure that we all know from earth prime. Straczynski is clearly writing Clark with a clear character progression in mind in later volumes. And this is something, that I am very much looking forward to. The only that bothers me is that I'll have to wait at least 6 months to get the next volume! Too many hype for a lame story. Still, got people talking about Supes again.